Not long ago, I had the pleasure of reviewing a set of gorgeous Trilogy series drums from Sakae. Along with that shell pack, the company was also nice enough to send a few samples from their hardware catalog so I had something to hang that beautiful rig on. However, the stands and pedals had so many features worth noting, I figured they warranted their own review – or series of reviews. Rather than lump all of the hardware items I received from Sakae together in the same review, I figured I’d break them up into shorter bites that focused on each individual piece. Hopefully that will make these write-ups a little easier to digest. This is great stuff, so it’s definitely worth the read. With its hefty black frame, brushed steel footboard, and large etched logo, Sakae’s X-Calibur bass drum pedal looks a little menacing right out of the box. It’s also heavier than a lot of other pedals on the market today, which makes it feel at first better suited to speed metal play than finessed figures. But that’s a bad read on this pedal. The X-Calibur is a silky smooth machine with an exquisite build designed to maximize foot-to-stroke energy conversion. That heavy-duty solid frame ensures that the pedal never feels wobbly or shaky. This thing is rock solid. While the frame has the tactile feel of industrial-grade construction, it’s actually quite sleek visually. 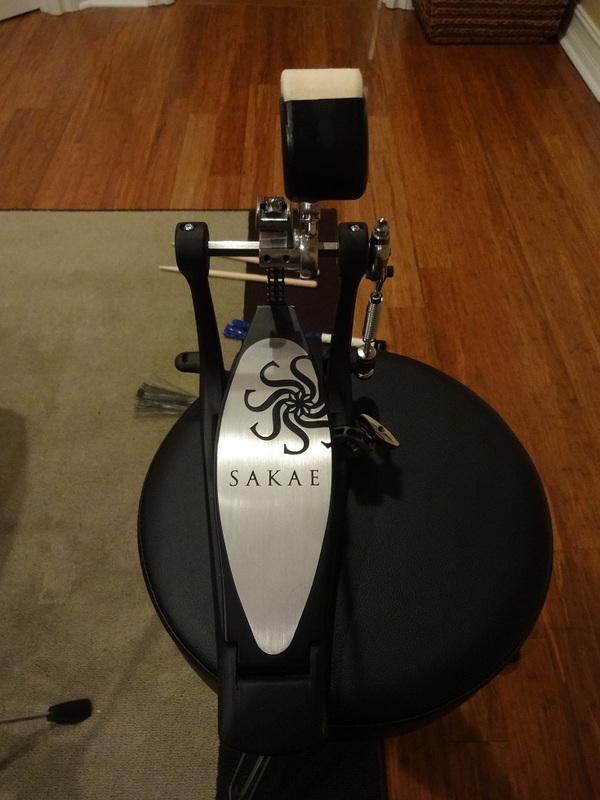 From the curved pylons that support the axle to the sloped heel plate to the hidden x-brace adding strength to the baseplate, the Sakae pedal has a very modern look. It’s also loaded with slick modern features. That sloped heel plate I mentioned above? It creates an extremely comfortable contour for heel down play especially for those with large feet and those that like to scoot the ball of their foot a little farther down the footboard. The pedal’s broad, padded hoop clamp with its offset tensioning wingnut is sculpted in such a way that it forces an even fit on just about every hoop. The spring cam is slim and lightning fast, and it features a top-side toggle for creating off-set action if desired. The primary cam has a highly figured design with what looks like a highly durable mold. The adjustable unit sports a double chain sprocket and mating memory locks to receive black-shafted reversible beaters. Both beater faces have deeply rounded cuts that leave plenty of impact surface room, but slope away before eating up too much batter head real estate. The beater heads are also fairly long and feel like they strike the head just a hair earlier than other pedals I’m used to. Now about that sublimely smooth action. If I had to compare the X-Calibur’s feel, I’d say its closest comp is the DW9000. It’s a fluid stroke with what might be a very, very subtle acceleration at the end. The return response is extremely quick, so much so that it feels like the pedal never really leaves the bottom of your foot. I normally play my pedals just a hair tighter than medium to speed up the stroke, but with the X-Calibur, I found myself preferring the stock tension setting. Every note was effortless and easy. The Sakae X-Calibur single pedal almost felt like an afterthought in the huge shipment I received from the company, but I’m glad I took the time to get to know it. It was extraordinarily well built, and felt like a great everyman’s pedal. It’s a little heavy, so drummers carefully counting pounds might not want to pick this up for the gig rig. But as far as playability is concerned, I don’t how much more anyone could ask for.